Regenstrief Institute investigator Josh Vest, PhD, is one of three finalists in the BioCrossroads Inject Tech Challenge. 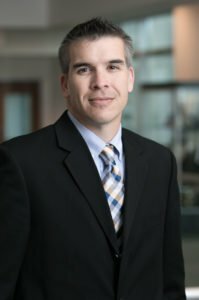 In addition to his work at Regenstrief, Vest is an associate professor and director for the Center for Health Policy at the Indiana University Richard M. Fairbanks School of Public Health. Vest is developing a platform to access and leverage data on social factors to allow health care organizations to address the whole patient to attain better health outcomes. Much of his research at Regenstrief focuses on technologies that facilitate the sharing of patient data between different organizations. The winners will be announced on Oct. 9 at the Indiana Life Sciences Summit.